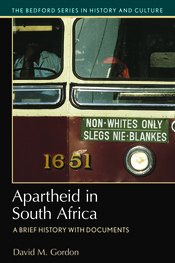 This volume introduces undergraduates to a collection of primary documents on apartheid in South Africa, one of the best known and frequently cited systems of institutionalized and legalized racial and ethnic segregation. David Gordon’s introduction provides context essential to understanding the emergence, development, and fall of apartheid, and highlights historiographic debates regarding apartheid, resistance to apartheid, and life under apartheid. Through a collection of sources that include key government documents, Afrikaner nationalist tracts and speeches, and records of meetings, students can explore apartheid’s basis, its social and economic impacts, life under apartheid, and forms of resistance to it. Document headnotes, maps, a Chronology of Apartheid in South Africa, Questions for Consideration, and a Selected Bibliography serve to further support student learning.